Skinnyfish Sound System is a loose collective of artists in and around the Skinnyfish eco system. It focuses on collaborations, reworkings, remixings and other creative endeavors that are separate to each individual artist's solo material. The purpose is to give the artists an outlet to create things that are not necessarily representative of their individual careers, but allow them to experiment freely. There will be more coming from Skinnyfish Sound System later in year, including electronic remixes of bush bands, experimental reworkings of traditional Indigenous catalogs and other interesting collaborations. 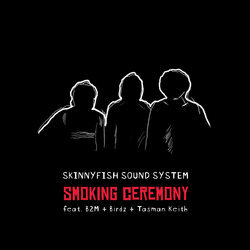 B2M, Birdz and Tasman Keith have gathered under Skinnyfish Sound System to offer Australia a new way of embracing Indigenous culture with their new single Smoking Ceremony. 'Smoking Ceremony' sees three Indigenous performers from separate clans across Australia come together to create a modern sonic Smoking Ceremony that gives voice to Indigenous performers.